A limited company is a business owned by a group of people (shareholders) who do not want to have unlimited personal liability for the debts of the business. This is because the company has its own legal identity, separate and distinct from the owners. A limited company can buy assets, borrow money and enter into contracts in its own name. Liability is defined as limited because the maximum that the owners can lose is the money that they have invested in the business. The owners are not personally responsible for the debts of the business so personal assets such as homes and personal bank accounts are safe. Companies are either started from scratch or (to avoid the paperwork and red tape involved in setting up a company from scratch) bought “off the shelf”. 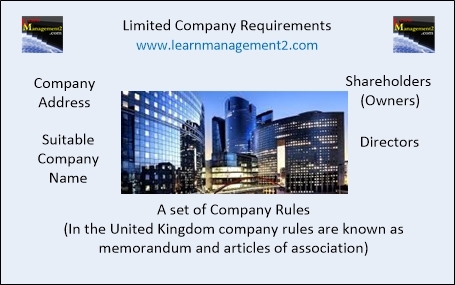 In the United Kingdom to create a limited company, legal formalities have to be completed as stated in the relevant Companies Act. This includes registering with the registrar of companies and completing the memorandum of association and the articles of association. You will also need to register the company with the tax authority HMRC. The Memorandum states the company's name; location, share capital and what the company can and can't do (this latter section is contained in an “Objects Clause”). Articles of Association can loosely be described as the “rule book of the company” because they will describe the conduct expected from the directors and govern administrative matters and the calling of meetings. The Certificate of Incorporation often referred to as the “birth certificate” of a company, is issued (in the form of a single sheet of paper) by the Companies House. The Certificate of Incorporation details when the company was formed, the company name and the company number. A private limited company is owned privately by a small group of people such as a family. A private limited company can not trade its shares on the stock market. Private limited companies can operate through just one director but it must have at least 2 shareholders. The share capital for a private limited company has to be £50 000 or less (there is no minimum). A private limited company has to use the letters Ltd after its name so that people dealing with the company know that they are dealing with a private limited company. Although private limited companies are usually small in size, they have to produce accounts and send them to registrar of companies annually. Furthermore unlike a sole trader, private limited companies have to pay auditors, hold meetings as stipulated in the Companies Act and share profits between all of the shareholders. The ability to offer shares on the stock market makes it easier to raise capital; however the accounts of the company are in the public domain. All financial records, including the director's reports must be audited and available to the Registrar of Companies at the Companies House and to all who want to scrutinise them. Furthermore the company is vulnerable to take-overs as rivals have the option to purchase shares.